A picture roundup of new products and developments. Advanced-design features A drag-reducing front spoiler on Volvo’s “concept” car retracts automatically at speeds under 40 mph, when it has little aerodynamic effect and could be damaged by curbs or deep snow. An electronic memory for the power-adjusted driver’s seat is another feature that may turn up in future models: Push a button (above, right) and the memory recalls seat positions for four people. The dash has small CRT’s for function and warning displays. A two-liter engine with fuel injection is turbocharged to deliver 136 hp and meet California’s emission standards. Ocean reel A one-piece tubular frame gives its new Triton ocean reel exceptional strength, says Shimano. The one-piece machined-aluminum spool resists distortion when the big ones put up a fight. Shimano American Corp., 205 Jefferson Rd., Parsippany, N.J. 07054. Crack detector Divers hold this ultrasonic scanner against offshore oil platforms or other steel structures to help detect cracks and faulty welds. Sonic echoes cabled to a ship are mapped on video monitors. It was developed at Harwell, research lab for Britain’s atomic energy agency. Smart phone Drop coins in this “smart” British pay phone and a microcomputer goes to work. A display shows the amount of money inserted. The computer deducts two-penny increments as time runs out. It also returns coins for unused time, or stores unused credit for the next call. Bike motor Add the 12-pound Streamline Tas to any bicycle or adult tricycle, and the two-cycle, 1.2-hp motor provides a 20-mph cruise speed (16 mph for trikes). Fuel economy is 300 mpg, says the maker (Palmer Industries, Box 707, Endicott, N.Y. 13760). Automatic dialer This auto dialer from Dictograph holds up to 30 numbers. What about busy signals? It automatically redials a busy or unanswered number for you every minute. Display shows number dialed, time, or elapsed time when unit is in use. The Phone Controller is $100. VCR changer Earlier Sony Betamax video recorders were limited to just 1-1/2 hours of record time (Beta I mode). No more. Add this changer and it automatically reloads up to three L-750 cassette tapes for three times the record/playback time. Exact changer model depends on VCR. $125. Head cleaner Pop this new 3M cassette into your VCR and in less than 30 seconds, the heads will be clean. The cassette contains five minutes of abrasive cleaner to remove dirt. When heads are cleaned, a message appears on the screen telling you to turn off the VCR. About $29. Watt checker Keeping down the electric bill is difficult, especially for large companies. But this digital tester could help by supplying info: It shows total kWh, present kW draw, and peak kW and the time it occurred. Du Pont Energy Management Corp., 10730 Composite Dr., Dallas, Tex. $800. Record cleaner First, it applies a cleaning solution to the record surface. Next, it brushes the surface to loosen dirt. Then the LP is vacuumed and blow-dried. Want more from an automated record cleaner? It does both sides at once. TMA, 35 E. Hills Dr., New Canaan, Conn. 06840. $695. Remote car alarm The problem with most car alarms is that you must be around to hear them. With this Mobile Alert from Radio Shack, however, you can be half a mile away—the pocket receiver beeps if your car’s been broken into. Car transmitter requires a CB license. Price: $100. Charger Hearing-aid batteries are double trouble for your wallet: They’re expensive, and they don’t last long. Now, claims The Battery Store (Box 141, Ridgefield, Conn. 06877), you can recharge them up to 500 times with this charger—for up to 10,000 hours of use. Price: $21.45. I love the betamax tape changer – I wonder how many of those sold? Does anyone remember “a fun car for sad times”? It came out during the oil crunch. It emphasized low cost: all flat panels for windows, manual pump to inject fuel at start up, simple fabric over metal frame seats and other “innovations”. 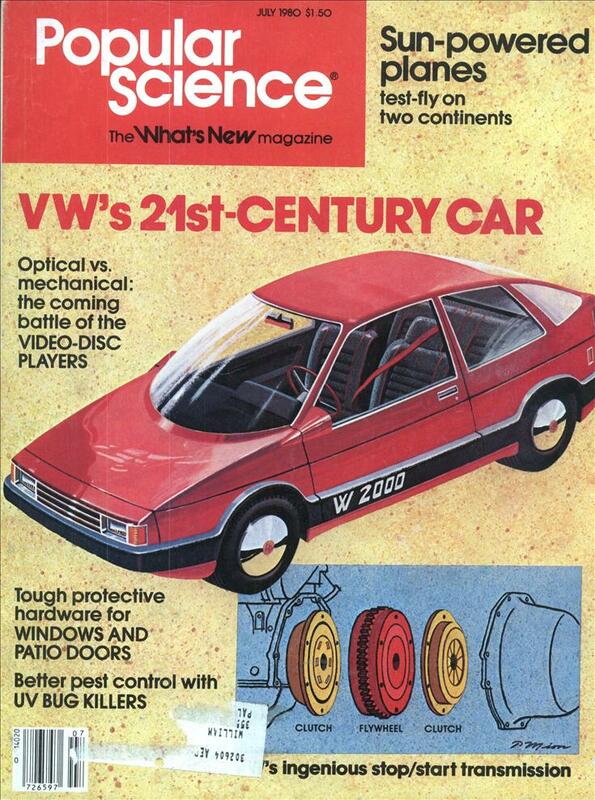 I think I remember seeing it in Popular Mechanics. There is nothing better for recording/playback heads then an abrasive cleaner! Palmer Industries is still in business and making motors for bikes! Placing 12 pounds on the front end of a POS bike is certain to improve the handling and be absolutely safe at speeds faster than the rider could achieve any other way. Bike helmets were invented a few years later for unrelated reasons. 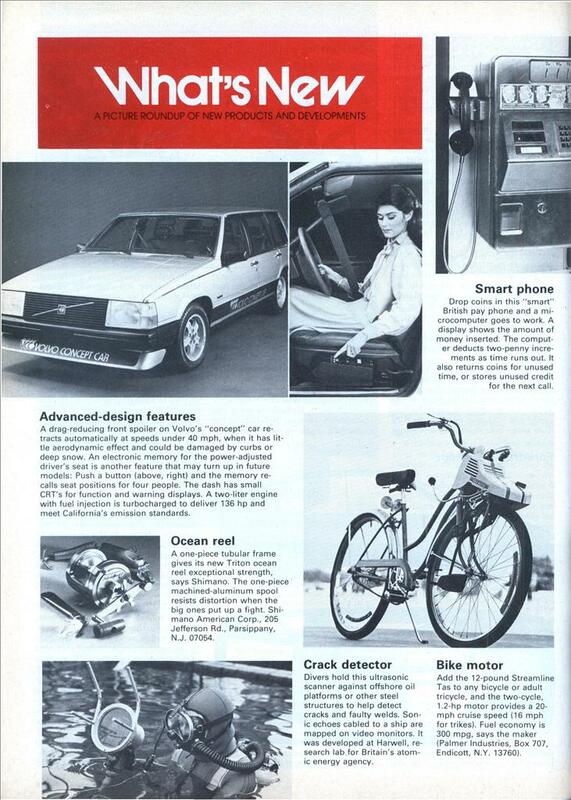 Well, at least the Volvo’s personal seat-position memory survived to this day. And when I raced in the ’70s we had helmets of a sort (“hairnets”) and Bell bike helmets have been around since ’75. Unrelated, as you say.